New Orleans rappers and Jet Lifers Trademark da Skydiver and Young Roddy have been working together for years. On December 2nd, they will release Family Business, their first full-length collaborative project. This morning, they release "Family Business," the album's title track and 2nd single, in an HNHH premiere. Producer Drupey Beats buoys "Family Business" with a flavorful soul sample that is situated squarely in Roddy's wheelhouse. 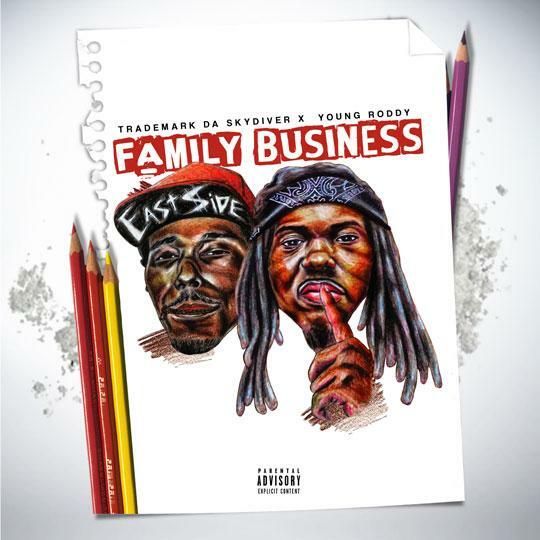 "['Family Business'] is definitely one of our favorite tracks off the project," Trademark and Roddy told HNHH by email. "Roll up, pour up, sit back and enjoy it!" Family Business features guest appearances from Kevin Gates, Cozz, Mick Jenkins, Smoke DZA, Le$, and LeeLee Haxi. Listen to the title track and pre-order the album on iTunes.